The bees have a hive that should be full of honey. Help the colony fill their hive to bursting in this buzzworthy puzzle game!Can you master the swarm?The bees have a hive that should be full of honey. 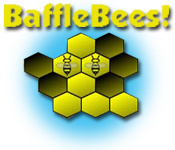 Help the colony fill their hive to bursting in this buzzworthy puzzle game! Correctly place the bees on in the hive so that no hexagon is left unhoneyed. Use fewer moves for a higher score. And with no time limit, Baffle Bees will have your brain working busier than a you know what.